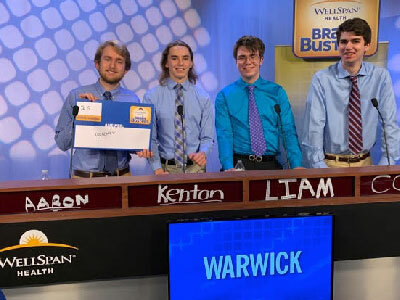 Warwick's Quiz Bowl team recently competed on WGAL's "Brainbusters," presented by WellSpan Health. "Brainbusters" is WGAL's academic quiz show highlighting the academic excellence of high school students across central Pennsylvania. The show is hosted by Rich Rosen. It started last October and will run through May of 2019, ending with a championship match. The Quiz Bowl team is led by captain Kenton Hertzog, a senior at Warwick High School. Other members include seniors Liam Blevins and Aaron Gabryluk, along with junior Cole Penkunas. These students competed in a heated face-off against Carlisle High School. Questions covered all areas of academics, ranging from math and science to popular culture and history. Junior Jonah Gibson served as the alternate for the competition. The Quiz Bowl team is coached by Carolyn Hoy and Carolyn Bogner. Be sure to catch these Warwick students in action on February 16th, 2019 at 12:30 p.m. on WGAL Channel 8.